Is this bad? Everyone was raving about the Julia side to the story, but I really enjoyed the Julie side. Maybe this is because she's so easy to relate to, thanks to her passion for writing and blogging. Instead of wanting to cook straight after watching this, I felt like writing. Julie & Julia (2009) is based on the memoirs of Julie Powell (Amy Adams), a writer from New York in 2002, and Julia Child (Meryl Streep), a famous chef who wrote a French cookbook in English in the 1960's. Julie is a woman who is stuck in a dead-end job and wants to do something with her life. She realizes that her love for cooking and her talent for writing could amount to something, and she decides to cook the 524 recipes in Julia Child's cookbook in 365 days. And blog about it. Along with hearing her story, we see the life of Julia Child, an American woman who has a passion for cooking, thanks to her long stay in Paris. Upon hearing that there is no French Cookbook written in English, she and a few friends decide to write one, becoming the most famous cookbook of all-time. Wow, this movie was inspiring. Apart from the sudden urge to start writing, I got very hungry. If only I could cook like these two ladies. As I said, I found Julie's side of the story much more entertaining, and that's probably got something to do with the blogging aspect of it. 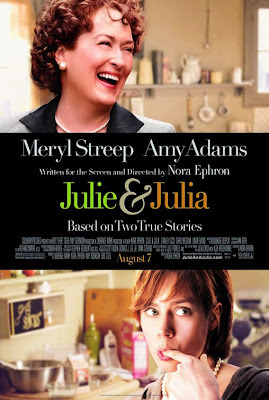 Meryl Streep is fantastic as Julia Child, and I would like to see her win that Oscar for her performance. Amy Adams is perfect as always, choppy haircut and all. Nora Ephron delivers another charmer of a movie, which is impossible not to enjoy but just a tad too long and slow. Recommend for everyone.